Android tablets like Samsung Galaxy Tab series, Google New Nexus 7, Huawei Pad, Lenovo Pad, etc. are still the hot spot in the market, all of which bear one common advantage: they have amazing touch screen, allowing owners to feel like they are actually in the scene when watching movies and videos on these gadgets. While it's satisfactory to enjoy great visual feast on these tablets, but what if you intend to enjoy your favorite DVD movies when waiting for your friend in a coffee shop or on the road? Of course, it's awful to take along DVDs. Wanna put DVD movies onto android tablet for enjoying new movie DVD releases on the move? Fortunately, there is a good solution that can help you out. You can rip DVD to Android Tablet friendly format. For Mac users, it is really a Gospel with MacX DVD Ripper Pro, which receives high reputation for its user-friendly interface and fast ripping speed, entitling you to rip DVD to MP4, and other formats supported by Android Tablet on Mac with ease. With this DVD tablet ripper, you can feel free to handle any copy protected DVDs and rip to your desired format. The professional DVD ripper for android tablet also features unique copy function on Mac, making DVD backup smoothly in a few minutes with original video quality. Download DVD ripper for android tablet on Mac or download Windows version, click "DVD Disc" button to import the new movies on DVD you want to rip. Alternatively, you can hit "DVD Folder" button to import your files. Select the output format as you want. First of all, you can choose "to iPad & Tab " button as your final format. Click the "RUN" button to convert DVD to Android smartphone or tablet via Android DVD ripper for Mac. You can view the whole progress and are able to cancel it at anytime. Note: This DVD ripper for android tablet has been updated to easily rip DVD on Mac, including the newest version macOS Sierra. It serves as an excellent DVD to video Converter, helping to rip DVD to all popular video formats, such as MP4, MOV, FLV, iTunes, etc, thus you can easily play your favorite DVD videos on iPhone (iPhone 7/6s included), iPad, iPod, Samsung, etc on the move. For Windows user, you can count on MacX DVD Ripper Pro for Windows to finish DVD conversion. BTW, to playback the converted DVD video on iPhone iPad iPod, you can take advantage of MacX MediaTrans to transfer video from computer to iOS devices easily. Notice: We only advocate using this best DVD ripper to rip commercial DVDs to Android tablet under the concept of Fair Use and do not encourage any illegal reproduction or distribution of copyrighted content. Please abide by the local DVD copyright law before doing it. This tutorial shares a best solution to rip and convert DVD to Huawei MediaPad 7 and 10 FHD compatible formats on Mac. In spite of all protected DVDs you have, with professional DVD ripper for Huawei MediaPad, you can play DVD movies on Huawei MediaPad 7 and 10 FHD tablets anywhere. If you want to play DVD movie on Lenovo IdeaPad tablet without DVD drive at all, read this article for a practicable way to rip and convert DVD to IdeaPad tablet on Mac and PC. 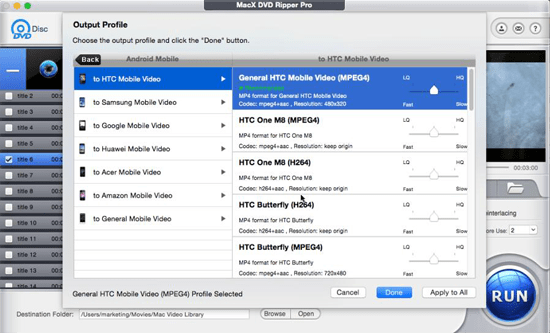 MacX DVD Ripper Pro is the best DVD to Android ripper for Mac which can freely rip DVD to MP4, MOV, M4V Android supported formats or iPad Pro/Air 2/mini 4 and backup any DVD disc, ISO image, DVD folder on Mac (MacBook Air/Pro, iMac etc) in 1:1 quality with original quality.